We were scheduled to perform a pool inspection in Scripps Ranch for the home buyer. This specific home buyer was only looking for an overview of the swimming pool and the pool equipment. As they have not had a swimming pool before, they wanted a better understanding. Knowing if the pool equipment needed to be upgraded or in need of necessary pool repairs. There was also a concern about the swimming pool surfaces and structure. This is very common, that is why we offer both written pool inspections and verbal pool inspections. Evaluating the pool plaster, we noticed that the plaster was in fair condition. We did find that the water needed to be drained due to high conditioner levels and that may have contributed to some slight staining that was not severe. The pool tile was clean and only had a very small amount of calcium build up in a small hairline crack in the grout. With the pool coping, there was a small area that was hollow and separated though solid and not a safety concern. These pool repairs for this Scripps Ranch home are minor in regards to what is normally found at a pool inspection. Pool repairs, in general, are not uncommon for these parts of the swimming pool as they are rigid materials. Seeing that we live in California and we have ground movement we will commonly see issues big or small. During the pool inspection, the home seller informed us know that the pool heater was not turning on. When looking at the age and knowing this, made it an easy recommendation to upgrade the pool heater. We will usually recommend the Raypak pool heater or the Pentair MasterTemp pool heater. This is due to the durability and performance we see from these types of pool heaters in the field. There is a chance that a pool heater repair could be made though, it is not beneficial long term. The pool heater repair would most likely be a short-term fix and may not be cost-effective. 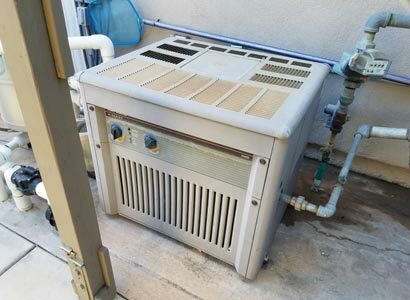 A pool heater not working during a big event or birthday party would be unfortunate and we often get emergency heater repair calls during these times. The pool heater failed during an important family event or party. 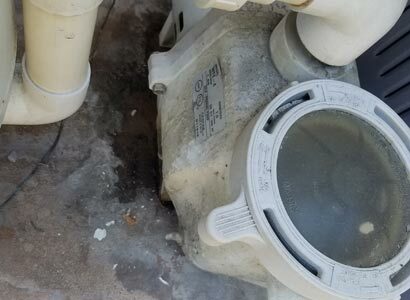 When inspecting the pool pump we found that it was on older Pentair WhisperFlo pump that was breaking down pretty severely. The pool pump has a leak as well and based on the overall condition and Title 20 laws, we recommended replacing the pool pump. Replacing this single speed pool pump will require the installation of a new variable speed, energy efficient pool pump. This is due to the Title 20 law that deems that any pool filter pump above a 3/4hp rated (This, in reality, equals a 1/2hp pump). Pentair is the variable speed pool pump that we recommend as we find it works well in the field and does not require pool pump repairs as often if at all. The pool filter installed at this Scripps Ranch swimming pool is an old D.E pool filter with a bottom backwash valve. This particular pool filter is metal and it is showing signs of damage. The bottom backwash valve was capped off making me believe the valve is leaking. 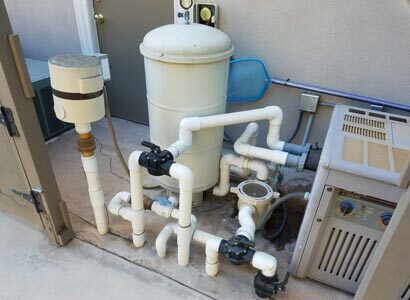 A really good reason that we recommended replacing the pool filter is that the buyer is wanting to have a salt water chlorine system installed. Salt water pools cause metal pool filters to corrode very quickly due to the salt in the water being corrosive. All of the pool equipment at this swimming pool in Scripps Ranch is made to be used manually. That requires the homeowner to walk out to the pool equipment to turn it on. Whenever they would want to use the hot tub, they will also need to go out and turn on the pool equipment and rotate the necessary valves. We often find that manually operated systems do not always get put back the way they are supposed to be sometimes causing issues with the pool equipment running properly. This home buyer is very interested in having new pool automation installed for their Scripps Ranch swimming pool. This pool controller will be used with their smartphone or tablet allowing for much easier control of the swimming pool. This blower for this Scripps Ranch swimming pool is very old. This is why it is very loud and will be better replaced with a newer and much quieter blower. A pool blower is installed to give the hot tub or spa jets a little more power and jetting effect for therapeutic use. A blower is also used in place of having an additional spa booster pump installed that will greatly increase electrical consumption. If you live in Scripps Ranch or any other area of San Diego we can help. We offer our pool inspections, pool equipment repairs or new pool equipment upgrades for all of San Diego County. 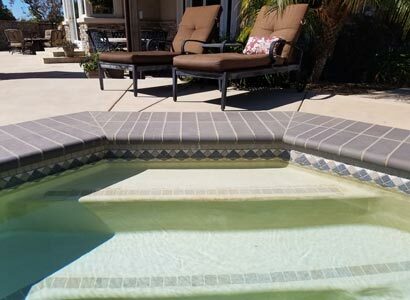 We are a licensed pool contractor offers a wide variety of services to help customers throughout San Diego. If you are in need of help, give us a call or fill out our contact form. We look forward to helping with your pool or spa or simply answer any questions you may have. We had ProTouch come out to look at our new home pool equipment and check water as items were not functioning well. They were extremely knowledgeable and gave several options for fix, replace, and/or continue use. It was nice NOT to get the oversell pitch and instead we were given various options to choose from. I’d highly recommend these guys for any and all pool equipment or pool maintenance questions or needs.